We’d love your help. Let us know what’s wrong with this preview of Quantum Space by Douglas Phillips. To ask other readers questions about Quantum Space, please sign up. A lot of Quantum Space is pretty typical for a sci-fi book. It's characters are pretty flat. Human interaction, meh. That isn't the emphasis here. The plot and the writing are okay. The plot is interesting, but I kept waiting for the suspense and action to slip into a higher gear, and it never really happens. Author Douglas Phillips is definitely a nerd. For real. Much of the book takes place at Fermi Lab right here in Illinois. (woot!) The writing is a little weak in spots, but the science and the tech is strong. His description of quantum mechanics, the standard model, and how the book uses it for space travel and communication is really interesting. I learned! (gasp) He deftly describes why we haven't heard from ET yet. Sorry, Carl Sagan. Read this nerdy quote and weep. Which brings me to the main premise of the book. The chance that humans are ever going to communicate with alien civilizations using radio communication is slim, maybe none. Sorry, SETI, but you're not likely to hear anything—ever. Nobody is broadcasting because at interstellar distances, radio is far too slow, and more importantly—they've found some other way. I love a simple, homemade website. The author's is a good example: http://douglasphillipsbooks.com/. He has posted additional images related to the book in his gallery there. It's a nice supplement, especially when reading the Kindle, which doesn't handle images very well. Phillips says this is the first book in a series. We'll see. A good read. Good science thriller and although I know next to nothing about quantum physics/mechanics it was still an enjoyable read. Author ends by explaining what is fact based and what he pulled out of his imagination. I am usually suspicious of books by authors I don't know something about. Time is precious, you know. But Doug Phillips invited me to this story and sustained my interest, completely. Marvelous storytelling! I've been reading science fiction since 1974, when a friend convinced me to read Dune. It is my preferred genre. Thanks for the adventure! I'll be back. This was undoubtedly the most mind boggling science fiction book I have ever read. I could not put it down. Entertaining, but occasionally scientifically inaccurate and cliché-ridden. Still, a nice piece of nerd prose. Intrepid male investigator - see most any Dan Brown novel - works with multiple women in different capacities attempting to solve a mystery. The author may have intended to showcase women in roles of leadership and technical prowess, but fails to bring those women to life. The most well drawn is a genius physicist, programming mage, black, beautiful, with ballet training, who hangs on nearly every word of the hero investigator. For his part, he's attractive to women, but doesn't know it. Our hero Intrepid male investigator - see most any Dan Brown novel - works with multiple women in different capacities attempting to solve a mystery. The author may have intended to showcase women in roles of leadership and technical prowess, but fails to bring those women to life. The most well drawn is a genius physicist, programming mage, black, beautiful, with ballet training, who hangs on nearly every word of the hero investigator. For his part, he's attractive to women, but doesn't know it. Our hero is on the scene with the full backing of the President, which doesn't have the same ring it had in the prior century. (Alert to authors: Give up that device.) Fortunately, we have an evil corporation on hand to balance out that weakness. Unlike those Dan Brown novels, there is no traipsing about interesting European locales; events unfold mostly in lab or office settings. Through sheer cleverness, lots of talking and forgoing of sleep, world-changing information is revealed. The novel is replete with long tutorials on quantum physics, string theory and the author's own fantasy physics. The story becomes more improbable with each chapter. Dialog often is well less than convincing. The fantasy physics doesn't hold together in my estimation. I kept being distracted by thoughts of how things could possibly work, for example the WiFi connection. Pure geek on my part, but as it has been called by some an excellent hard SF novel, the contrary point seems fair to make. Dr. Daniel Rice is a government science investigator, brought in on a mission to investigate the mysterious disappearance of the Soyuz, a capsule transporting astronauts from the International Space Station, back down to earth. With his partner, Marie Kendrick, a NASA operations analyst, Daniel begins an investigation that has them pondering the very real existence of additional quantum dimensions. What they discover will have consequences not only for the lost astronauts, but for the entire human race. 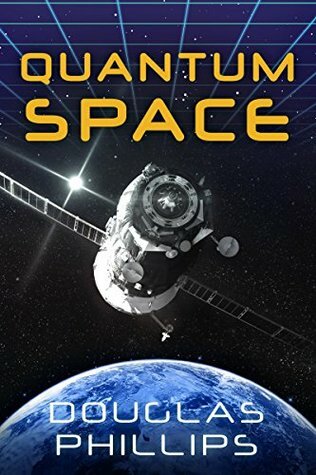 Quantum Space is a mind-bending ride; one that demands just as much from its reader as it gives – and that’s a good thing. Phillips begins the book solidly in the real world (though many might not realize it), incorporating scientific concepts such as the standard model, string theory, and particle acceleration. With the aid of a few helpful illustrations, Phillips does a fairly good job explaining these concepts in a way that a standard non-scientist can understand. That said, there were certainly chapters that required a pause for consideration, and took some time to sink in. Adding balance to the scientific elements of the story, Phillips includes interesting personal relationships that allow characters to play off of each other, both personally, and professionally. Overall, their interactions were satisfying and believable, though there were a few brief moments of dialogue where I found myself questioning whether the character would ‘actually say that.’ This, and the occasional point of view confusion are the only reasons I deducted one-half a star. The interactions between Dr. Daniel Rice and Nala Pasquier—another scientist Dr. Rice is led to investigate—were by far the most interesting human elements to the story. Nice nerdy Sci Fi. Worse than Martian, though. Book structure heavily reminded me Dan Brown (and I am not a fan, to put it mildly -- not after reading Digital Fortress), where there is a single (and single, as in "not married") male protagonist and multiple females who are mostly there to show how cool the male protagonist is and to allow him to explain at length this and that throughout the book. However, explanations are not lengthy and not condescending, the book is easy to read and sciency bi Nice nerdy Sci Fi. Worse than Martian, though. Book structure heavily reminded me Dan Brown (and I am not a fan, to put it mildly -- not after reading Digital Fortress), where there is a single (and single, as in "not married") male protagonist and multiple females who are mostly there to show how cool the male protagonist is and to allow him to explain at length this and that throughout the book. However, explanations are not lengthy and not condescending, the book is easy to read and sciency bits are solid. When the author starts to stretch sci into sci-fi, I only have one major complain: (view spoiler)[how come (bidirectional) wifi camera works, yet communications with spacecraft are essentially one-way?. But this fault is not large enough to kill the mood. quantum. Give it a try I think you will enjoy it. I saw all the stars on this book and decided to give it a go. The story is set near future and the author uses very believable science as the basis of the sci-fi. Enjoyed it and will start the sequel now. An entertaining story It is a science fiction based more in science than fiction. Great concept and it stuck to the story. It did not get side tracked by out of place romances, conspiracies or villains. Loved all the science. And the author's notes at the end are fantastic. Good story, too! Well told by Kirby Heyborne, who is always amazing. This book is not a fantasy that is labeled incorrectly as Science fiction. It is true Science fiction. I can't wait for the next thrilling book in this series. Great book, story moves quickly and the science stuff is the perfect amount of detail. Looking forward to reading the next in the series. If you don’t know what Fermi’s Paradox is you need to read the book. The entire book answers the question of why we have not be contacted by Aliens when mathmatically its’ almost certain we are not alone. The Science in SciFi is good. While there are a few curse words the book is safe for younger readers. The hero is intellectual with a hint of masculine and the heroines are both smart first and hot second. I’ll definitly read the second book. Stretch your ability to conceptualize until your brain hurts (just a little). I enjoy real science mixed in with my fiction. It makes it much easier to suspend belief and ride along with the characters. The author does a great job here. I thoroughly enjoyed the adventure he created. He also seems to have a great respect for the multiple perspectives of most of his characters. It shows in how he doesn't just rely on the blunt, bludgeoning of his characters into the standard underdeveloped percepti Stretch your ability to conceptualize until your brain hurts (just a little). As a born scientist, I truly enjoyed this book. 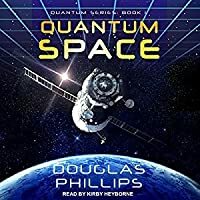 There is rarely an author that can deal with something as complex as quantum physics while also telling a compelling story; perhaps Doug can be added to Asimov and Clarke, in a decade or two. My only minor criticism is the tired trope of the "evil capitalist corporation", although it would make the book more attractive as a Hollywood screenplay, I'm sure. Regardless, I'm anxiously awaiting further tomes from this very balanced author! Very enjoyable read as a hard science fiction and first contact novel. I have truly enjoyed reading this book make's you Wonder and keeps your interest up and makes your want more ! I highly recommend. This book was an interesting story until I read the afterward and discovered that almost all of the science in it, and there's a lot of science, is real. Then it was fascinating! Despite having the feel of fantasy this book is based on a lot of truth, which makes it so much cooler! It did delve into some unproven theories, but it was so interesting to read! I would highly recommend it for anyone interested in science and it's possibilities. Douglas Phillip's speculations on an interstellar community accompanied by our invitation to join it .is a fascinating and enjoyable read. I'm looking forward to the next book in this intriguing series. Well written story with engaging characters and a great story line. Can't wait till the next installment in t series. One of the best SciFi books I have read in a while. Based in real science with plausible speculation. I must confess that I am a big follower of Quantum Mechanics and have spent time at Fermi Labs west of Chicago. Have always been fascinated with Neutrinos. Private corporations are evil and the federal government is the embodiment off all that is good and just in the world. if only we could,do away with corporations all would be right in the world. If you believe that than you will be able to enjoy this 'one dimensional' mystery. I was 10% into the book when I predicted the obvious villain. My other problem with the book was the poorly-implemented info dumps. Not all were necessary, if the author had more faith in the intelligence of his readers. They were also presented in a simplified spoon-fed manner, as if instructing, again, middle-schoolers, no offense to school children or their educators. I have no doubt that the author is a smart guy and knows his science. His likely non-scientist readers, though, are not entirely stupid and probably have some familiarity with fundamental physics; if not, let us figure it out. At this point I'm ready to read anything from this author. This is a real world story about scientific discovery and first contact. It involves some of the leading institutions searching for validation of string theory.The negative influence on the work from corporations and governmental agencies are explained without overdramatic plot twists. Doug has two science degrees, has designed and written predictive computer models for natural processes and engineered structures, reads physics books for fun, flies airplanes to waste money and peers into deep space with his backyard telescope. Doug splits his time between Seattle and Tucson, travels the world with his wife, hikes with his two sons, and becomes a child all over again with his grandchildren.